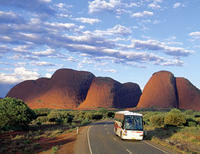 Discover Uluru, Kings Canyon and Alice Springs on this 3-day tour starting at Ayers Rock and ending in Alice Springs. Explore Australia’s great Central Desert – watch the sunrise over Uluru (Ayers Rock), visit the magnificent Olga Gorge and Kings Canyon, with their beautiful waterholes and dazzling views. Stop off at a huge cattle station and the remote, early telegraph town of Alice Springs.